Innovation in Architecture - K Sharp shares 3D printing knowledge | K Sharp Ltd.
A lot of the work at K Sharp is based around innovation, both small and large. Finding new and effective ways of solving problems. However, in many cases, this doesn't involve creating new technology, but bringing a solution from one industry to another. We are also keen on engaging with other businesses in different sectors, because you never quite know where they may unexpectedly lead. This was exactly the case with the team at Darkin Architects in Llanelli. We invited the team round for a brew and to have a look at what we have been investigating with 3D printing. Barry delivered a workshop on what we had learned about the 3D printing process, different types of printer, the processes involved, and a look at some examples of what can be printed, including a 3D printed house that allows you to take it apart floor by floor to look at detail. 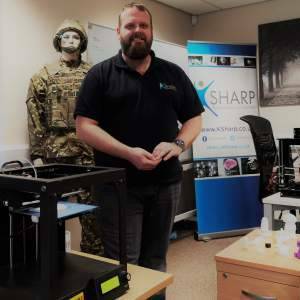 David Darkin, the Managing Director, immediately grasped the potential to give his clients a more hands on experience in visualising their solutions and has since bought their first 3D printer and is now looking at how the process from drawing to 3D printed model of a solution can be built into their processes. Here at K Sharp, we are very pleased that we could share some of our knowledge to a very different industry to us, we are very excited to see what the team at Darkin Architects prints next!